point on which it should be struck to give it the requisite direction. 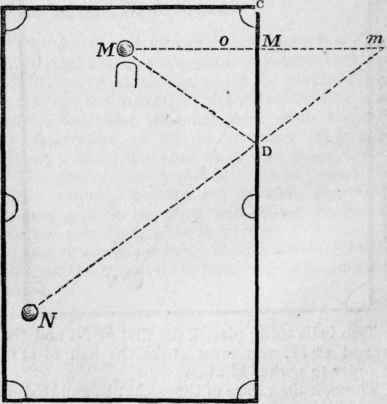 Again, conceiving the imaginary line prolonged by the radius of the ball, the point where it will terminate will be that by which the ball N will pass. In this consists all the skill of the game; but although it must be confessed, that mathematical theory alone will never form a player, still it will be found, when fine practice is based upon sound theory, that the most brilliant results are attained.